British water engineering company, Biwater, have been awarded a USD $1.2 billion contract by the Kurdistan Regional Government to meet vital water supply and sanitation needs. Surrey, UK – 8 December 2016: Biwater have been contracted to deliver water and wastewater treatment solutions for the cities of Erbil and Sulaimani in the Kurdistan Region of Iraq. Works will alleviate the current strain on existing infrastructure and reduce the region’s reliance on dwindling groundwater reserves to deliver long-lasting environmental benefits. “Since Biwater was founded in 1968, we have delivered many large international water projects across the globe, including strategic turnkey solutions throughout the Middle East. The signing of this contract in Kurdistan is a major landmark in providing technological and financial solutions that address complex water-related challenges in the region,” said Sir Adrian White, CBE, Chairman, Biwater. As a part of this project, Erbil will be provided with a 600,000 m3/day state-of-the-art water treatment plant, while Sulaimani will benefit from water treatment plant upgrades and the construction of cutting-edge wastewater treatment works and sludge treatment facilities. The London-based event was arranged to mark the signing of a loan to fund the project’s Development Works, which will include all relevant site surveys, social and environmental impact assessments and detailed designs. Development Works will run for a period of 6-12 months before construction. 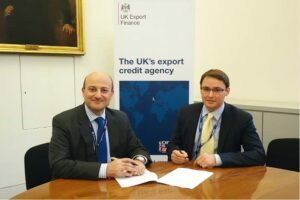 The loan for the Development Works is being financed by UK Export Finance (UKEF). J.P. Morgan is acting as the Facility Agent and Mandated Lead Arranger for this initial loan on behalf of UKEF to The Kurdistan Regional Government. Biwater provides large-scale water and wastewater solutions for cities across the world. Since its inception in 1968, Biwater has gained recognition for its innovative approaches aimed at overcoming the world’s most pressing water-related challenges. Throughout its history, the company has grown to meet the demands of over 90 countries experiencing severe water stress, compounded by burgeoning populations – financing, consulting, process engineering, designing, constructing, operating, maintaining and owning water facilities – in both rural and urban environments.